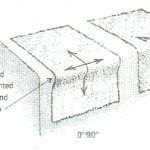 Corners that require fiberglassing need to be rounded to allow the fiberglass cloth to conform to the corner. If the fabric you are working with won’t conform to a rounded corner, here’s a tip that may help. When draping fiberglass around a corner, orient it so the fibers are at a 45° angle to the corner. The fibers will conform much better than if oriented at 90°, because they are not bending nearly as much. You can accomplish this in one of two ways: orient the whole piece of fiberglass at 45°, or cover the corners separately with a biaxial fiberglass tape with its fibers oriented 45° to the corner. A custom biaxial tape can be made by cutting a strip from plain weave (0°/90°) fiberglass cloth on a 45° angle to the length of the roll. The biaxial tape strip can be cut to any width (see photo). 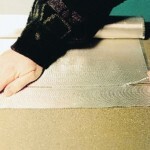 Sometimes multiple layers of light-weight fiberglass tape are used to protect corners while the flatter portions of the project are covered with a single layer of heavy fiberglass cloth. The heavy material obviously won’t conform to the radius, so it is left just a bit short of the corner. The corner can then be covered with multiple layers of light-weight fiberglass cloth, built up to match the weight to the heavy fabric. Fiber must bend more when oriented at 90 degrees to the edge and may leave a gap. 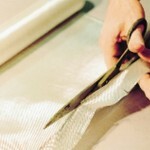 Here’s a nice tip for cutting straight ends on fiberglass cloth. 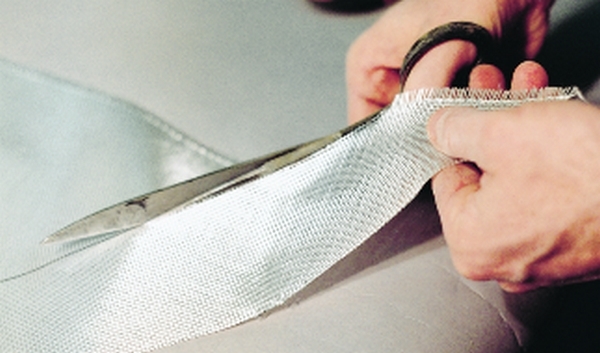 Start by locating a single fiberglass strand that runs all the way across the fabric. Pull on it from one edge while holding down the opposite edge of the fabric. 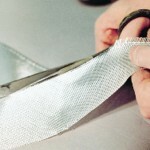 If you cannot get a good hold on the strand to pull it free, cut a 2 or 3-inch slit into the edge of the fabric so that more of the strand is exposed. Now there should be sufficient hold to pull the strand free from the cloth. Some fabrics are more difficult to remove strands from than others. This method works on most plain weave 0°/90° woven fabrics. The fiberglass strand often makes a zipping sound as it is pulled free from the woven fabric. Removing one strand gives you a visual path to follow with a pair of scissors or with a fabric wheel cutter. Pull a single fiberglass strand. Cut along the visual path. This entry was posted in Shop Tricks and tagged #9, Epoxyworks #9, Spring 1997, Tom Pawlak on June 26, 2014 by ewadmin.